'Hallmark Hotel The Welcombe' in Stratford-upon-Avon has invested £100,000 to refurbish its luxury state of the art Spa which re-opened on Monday 26 March. 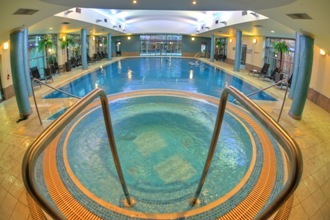 The improvements include a refurbished swimming pool hall including the re-tiling of the pool, a new Sauna, refurbished steam room, re-decoration of the hall including new lighting and new relaxation loungers, refurbished vitality pool including re-tiling and new lighting and the redecoration of the Spa treatment rooms. In addition a new Spa product 'BABOR' is being introduced in all the treatments rooms. Based in Germany and for over 50 years, BABOR dermatologists, geneticists and biochemists have worked with universities and scientific establishments to find solutions to skin problems and needs. BABOR products precision formulas are based on innovative active ingredients which are designed to deliver maximum individual results. The Spa is also introducing a new treatment menu and a new Spa food and drink menu which includes healthy smoothies. Daniel Graham, General Manager at The Welcombe Hotel said "We're delighted to have undertaken our Spa refurbishment programme so creating a fresh and revitalised place for our guests to unwind in. Our Spa remains one of the most state of the art facilities in the region and is a huge asset to the hotel. We hope to see many of our members, residents and guests at our launch event".